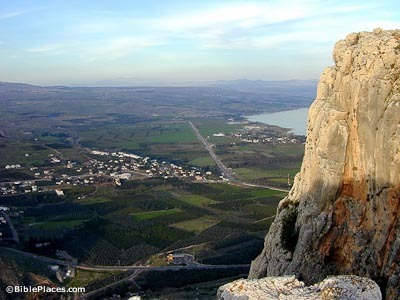 From the summit of Mount Arbel on the western side of the Sea of Galilee, one can see the entire lake, the city of Tiberias, the mountains of Galilee, and the Golan Heights. On a clear day, Mount Hermon is visible. Hippos (Susita) was a major city of the Decapolis located on a round hill overlooking the shore. The modern harbor of Kibbutz En Gev is visible below it. In the first century, at least 16 harbors were located on the lake. All the lake’s settlements had their own harbor, even if it was very small. The largest one belonged to Gadara had a 200 meter breakwater. In 1986 a wooden vessel from the first century was discovered near Nof Ginosar on the lake’s northwestern shore. Studies have determined the type of wood that was used (mainly cedar and oak), the style of construction (mortise and tenon joints), the date (on the basis of construction techniques, pottery and Carbon 14 tests) and the size (26 by 7 feet – big enough for 15 men). Pictured at right is a reconstruction of what the ancient boat might have looked like. This was formerly on display at Kibbutz En Gev. Three types of fish were primarily sought by fishermen in antiquity in these waters. Sardines likely were the “two small fish” that the boy brought to the feeding of the 5000. 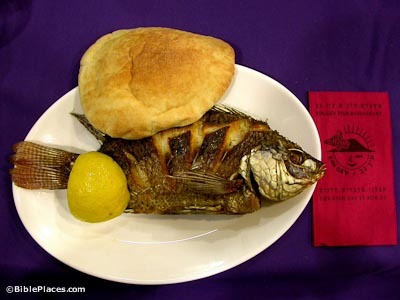 Sardines and bread were the staple product of the locals. Barbels are so known because of the barbs at the corners of their mouths. The third type is called musht but is more popularly known today as “St. Peter’s Fish.” This fish has a long dorsal fin which looks like a comb and can be up to 1.5 feet long and 3.3 lbs in weight. The peaceful calm of the Sea of Galilee can quickly become transformed by a violent storm. Winds funnel through the east-west aligned Galilee hill country and stir up the waters quickly. More violent are the winds that come off the hills of the Golan Heights to the east. Trapped in the basin, the winds can be deadly to fishermen. A storm in March 1992 sent waves 10 feet high crashing into downtown Tiberias and causing significant damage. 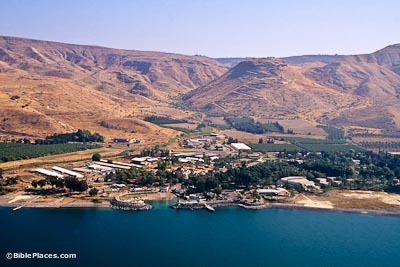 At BiblePlaces.com, see the related sites of Bethsaida, Capernaum, Chorazin, Cove of the Sower, Mt. of Beatitudes, and Tabgha. The Sea Of Galilee (Daily Bible Study) General information about the area with links to many topics related to historical geography, biblical characters, biblical manners and customs, and the life of Christ. 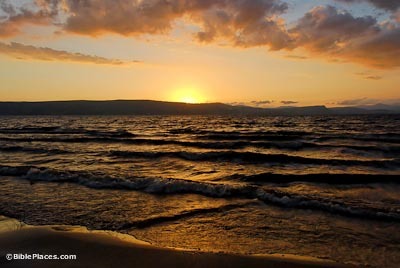 The Sea of Galilee (Jewish Virtual Library) Gives a brief history of the region. Sea Of Galilee Yields Clues For Weather Forecasting (ScienceDaily Magazine) A fascinating study done by Texas A&M University toward the end of accurately predicting currents and temperatures in a body of water. Galilee, Sea of (WebBible Encyclopedia, ChristianAnswers.net) Interests the reader with both physically and biblically descriptive facts, including internal links to related topics. Galilee (Biblelands Tour) Photogallery is a bit difficult to navigate and pictures are not spectacular, but give a good feel for the region. Sea of Galilee (Kibbutz Hotels Chain) A modern map of Galilee. Sea of Tiberias (The Catholic Encyclopedia) Paints a vivid picture of life in this region, both in biblical and modern times. Text only, no photographs. First Century Harbors on the Sea of Galilee (The Urantia Book Fellowship) Maps remains of first century harbor breakwaters. Accompanying text by Mendel Nun, expert on the Sea of Galilee from Kibbutz En Gev, Israel. 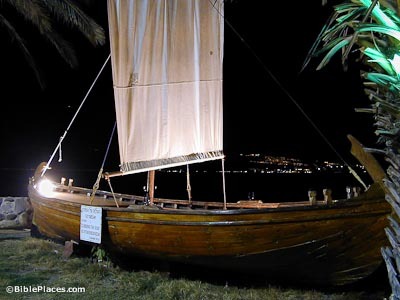 The Roman Boat from the Sea of Galilee (Israel MFA) Tells the story of the ancient boat found by the shore of the Sea and restored for public viewing. Copy of this page at Jewish Virtual Library. Sea of Galilee (Encyclopaedia of the Orient) Introduces the region in a brief article with links to related topics within the encyclopedia. 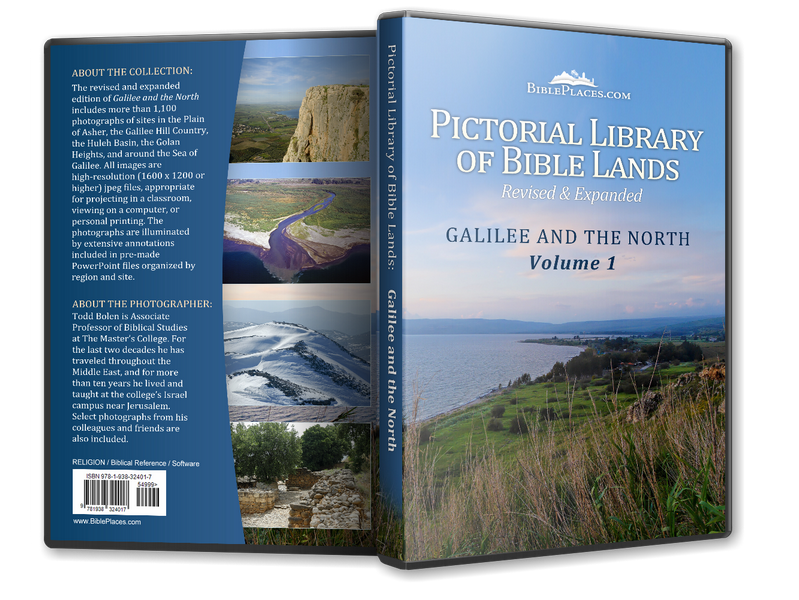 Results for Galilee (encyclopedia.com) Gives three brief entries relating to Galilee. Full articles with links to related topics can be accessed by clicking on the highlighted title. Sea of Galilee (olivebranch.com) Page layout is a bit awkward, but contains good information with some digging. Sea of Galilee, Israel (Travel for Kids) Offering a unique perspective, this site focuses on aspects of the region of interest to families with children. Tiberias and the Sea of Galilee (Bible Walks) Photos of the Tiberias area in the Galilee region. Sea of Galilee (Into His Own) Brief encyclopedia-type article with many internal links to articles on pertinent people and places. Limited photos. Sea of Galilee (Christian Travel Study Program) Features several good pictures with excellent identifying captions, accompanied by text highlighting interesting features of the region. 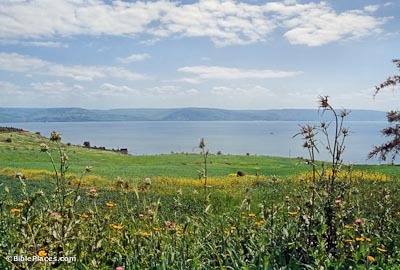 Kinneret, Lake (The Department for Jewish Zionist Education) Approaches the region from a mainly historical perspective, giving a concise summary of the historical background. The Galilean Fishing Economy and the Jesus Tradition (K.C. Hanson) “…Examines fishing as a sub-system within the political-economy and domestic-economy of first-century Galilee.” Although references to “the Jesus Tradition” imply a non-historical view of the biblical accounts, the article provides an excellent historical-cultural framework in which to place Jesus’ ministry.